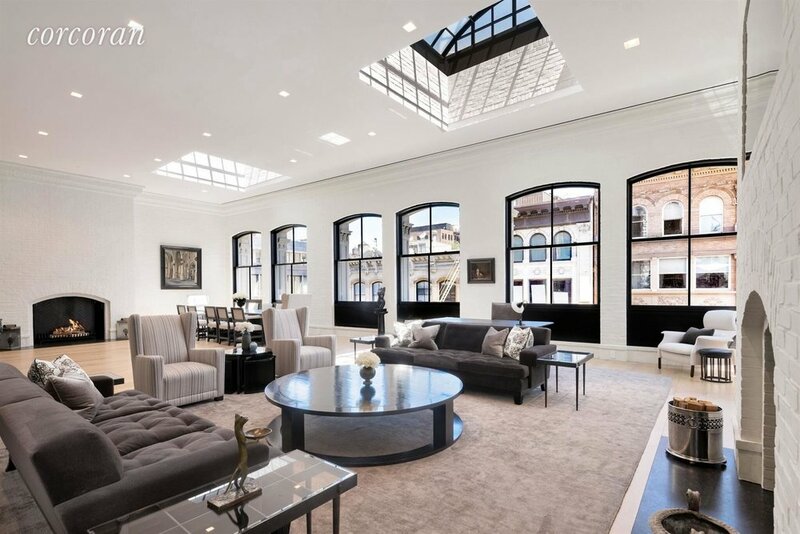 Our favorite listing this week is 421 Broome St. Penthouse a 4 Bedroom, 6.5 bathroom, SoHo loft transformed into extraordinary living space encompassing over 8,000 square feet of interior and 3,700 square feet of private exteriors. And will cost you $65,000,000. This AML Architecture/Roman and Williams designed home, four years in the making, has been constructed from the ground up with entirely custom fabricated steel doors, windows and skylights. Only the finest natural materials have been used to accent the property including: Meyer of Munich, Dinesen, Dolomite and Ann Sack, as well as appliances by LaCanche, Wolf, SubZero, Miele and Lynx. With direct elevator access to each of the living areas leading to entries appointed with profiled steel gates, this Penthouse property begins on the 5th Floor, opening into a 31 X 46-foot great room. 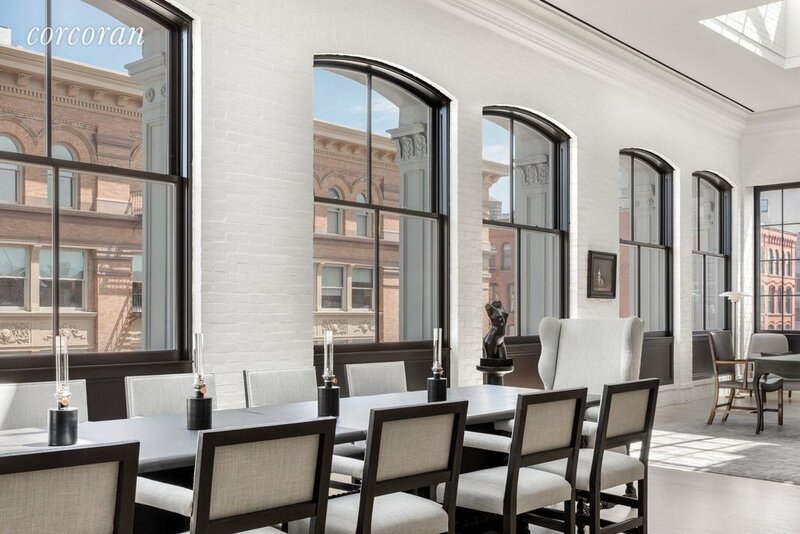 Marked by six oversized arched windows, this room overlooks historic Soho below 15 foot ceilings and two skylights, anchored by opposing wood-burning fireplaces encased in honed petit granite. Outfitted to the liking of a professional chef, the spectacular 20-foot brick barrel-vaulted ceiling kitchen includes and 86-inch range, black granite countertop/backsplash and wood-burning fireplace, as well as two proper butler's pantries and wine rooms. A second master suite with a private terrace, guest bedroom with bath, wood-paneled home office and laundry room complete the floor. Encased in a LaForge bronze stair railing, a Chesney cantilevered black marble staircase leads to a master level with his and hers bathrooms. Marked by over 20 custom closets, dumbwaiter, coffee bar, wood-burning fireplace and dual private terraces, this master suite is unlike any offering on the marketplace today. One flight up, the top level opens to entertaining terraces, paved in Cenia Gray granite, are designed for outdoor/indoor living with large heated, hotel-style, steel and glass canopy, wood-burning fireplace, and TV alcove- all accessible by six sets of French doors. A screening room with wood-burning fireplace, fitness room, second full kitchen and laundry, and dining room have been intelligently placed to serve this floor's interior. Three additional landscaped terraces, equipped with custom gas lanterns, offer a heated spa, fountained garden, and open-air dining. An adjoining staff room with full bath completes this incomparable residence. J. Eric Becker is the listing agent at Corcoran. For more information click here.